Some of the most frequent questions we receive are to do with choosing the right application to best suit the customer requirement. The following information should help to clarify which solution best suits your requirements. * Departments are set up in System Settings and can be used for gathering extensions under an umbrella name such Sales, Accounts or Support. There is no performance reporting for departments and bear no relation to groups programmed in the telephone system database. The reports by department would show total calls or individual calls for all extensions within that department. You have an auto attendant answering calls before passing them to groups and you want to report on the actual time it takes for calls to be answered by a member of staff and you want to report on calls where the caller abandoned the call before having their call answered by a member of staff. The call recording applications are offered in either Ultimate or Compact formats. Ultimate is shipped as a turn-key recorder solution complete with PC application server, onboard PCIe recorder boards for analogue, basic rate or primary rate ISDN (SIP and VoIP do not require a board) and the Ultimate recorder application. Compact is shipped as an external USB recorder box (which contains a voice board) together with the Compact recorder application and would require a PC application server to plug into and to load the application onto. Recordings are stored on the PC application server’s hard disk drive (HDD). Both formats record lines via a passive tap across the lines or via port mirroring if SIP/VoIP. (See relevant product pages for connection methods). The Compact call recorder interface provides for easy search, retrieval and playback of recordings. The Compact interface provides basic call logging and access to 35 reports which can be run on demand or automatically run on a scheduled basis. The Compact does not have a ‘Today’ screen. Please note that when a Compact Recorder and Office Pro are sold together, the Ultimate recorder interface will supplied. 175 reports which can be run on demand or scheduled to run automatically (more if Pro installed as well). KX-NSF101W – CTI 3rd Party system CTI interface – Enables CSTA Port for applications other than CA Server – This license will be required if connecting Office Pro, CTI, Operator Console, FrontDesk or Campaign to the NS700. There is no requirement for this license if there is no TAPI required. Intro, Express and Voice receive their call logging data over the LAN. KX-NSA020W – CSTA MUX 3rd party x 1 Activation Key (AK) – Supply this in the event that more than one vendors applications will be connecting via TAPI or CSTA. ie Mondago GoConnect and Office Pro. 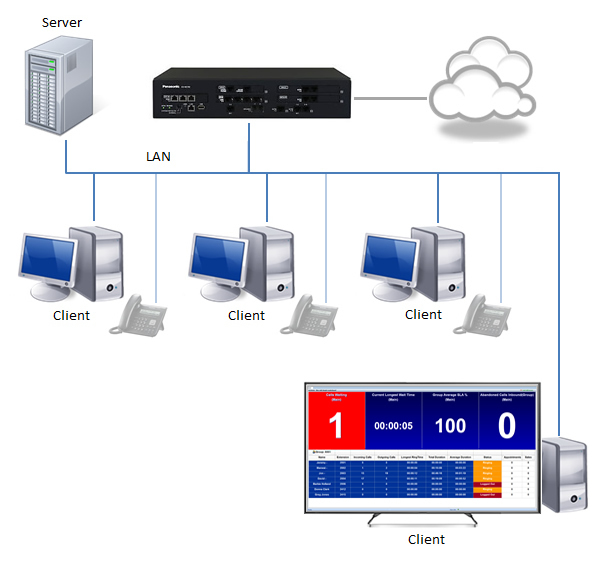 Enables multiple CSTA services to connect to PBX (max 4) – 1 AK is required for each TAPI/CSTA server application but multiple Office applications (ie Office Pro & Office CTI, etc) would only ever need 1 AK. CA Server does not require an AK. If KX-NSA020W licenses have been purchased, there is no requirement for a KX-NSF101W. When using CA in PBX direct mode, no CSTA connection is required and CSTA MUX is not necessary when used alongside CommsOffice Pro etc. When using CA Server, the CSTA connection is used and so CSTA MUX would be necessary when used alongside CommsOffice Pro etc. However, note that the CA Server does not require a CSTA MUX license to connect as it is already licensed.